With over 10 years experience in fine dining cuisine, Dane has widened his culinary repertoire by travelling and expanding his knowledge of world cuisine. A graduate of the acclaimed Johnson and Wales University Miami, he has held high positions at numerous high-profile award winning resorts in the Caribbean; the Cotton House in Mustique, Anse Chastenet Jade Mountain in St. Lucia and The Sandy Lane Hotel in Barbados to name a few. His winning approach makes him a popular choice with families. 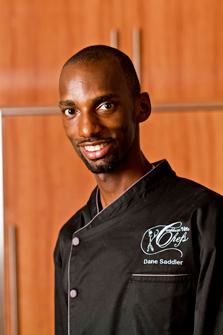 Chef Dane’s sense of humor and quick wit make him a favorite entertainer among clients especially kids and those seeking interactive cooking classes and dinner. Dane says "I like to include my guests in preparation through exchanging ideas and suggestions rather than dictating their menu to them." A graduate from Queen's College Secondary, and the Hospitality Institute, he started his career at The Dining Club under renowned chef Peter Edey. He has since worked at a number of restaurants across the island in positions of authority,Savannah Hotel as Executive pastry Chef, Sea Breeze as Head of Pastry and Sous Chef at Olives Restaurant. His friendly and hard working demeanor has gained him much respect from his peers. 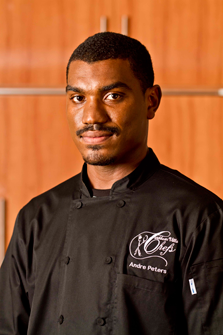 With ten years experience in the hospitality sector, Andre Peters has engaged himself in all cooking disciplines. He has held positions primarily as a pastry chef, but is thoroughly competent in all forms of cooking. Starting with the international Relais and Chateux chain here in Barbados as an apprentice chef at The Cobblers Cove Hotel, he earned his certification in Advanced Professional Cooking at the Hospitality Institute and later received his Chef Certification from the renowned Culinary Institute of America. His training and dedication gained him a place as leader of the Barbados Junior Culinary Team which won gold under his wing in 1996. Full of charm and knowledge you as a guest will have a chance to learn from and enjoy the company of this fine chef. 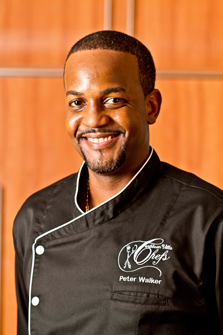 Peter “tosh” Walker comes with over 15 years in the culinary arts arena ranging from private guests services to fine dining restaurants and hotels. Chef Tosh as he is affectionately known can make you feel at home with his welcoming personality.